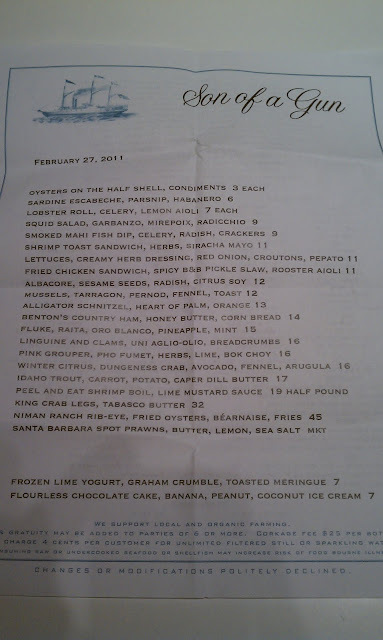 Son of a Gun, the second restaurant from Animal duo Jon Shook and Vinny Dotolo, opened tonight after much anticipation. The opening date was only announced yesterday, via an article by Noah Galuten in LA Weekly, and the phone lines for reservations opened at 2 pm the same day. Son of a Gun is a seafood focused restaurant, with decor to match, and unlike Animal has an ambitious cocktail program to match. Lindsay Nader, formerly of PDT and the deputy editor of Food & Wine's Cocktails 2011 has curated a list of 35 cocktails, classics or modern classics. I've been excited about the prospect of this restaurant ever since eating Jon & Vinny's fried chicken sandwiches at Cart for a Cause last April with Zach from Midtown Lunch LA. Almost a year later the dream of having that sandwich on a menu in Los Angeles has been realized. The $11 sandwich is described on the menu as "Fried Chicken Sandwich, Spicy B&B pickle slaw, rooster aioli" and has been described by the chefs as in the tradition of Bakesale Betty, in Oakland. 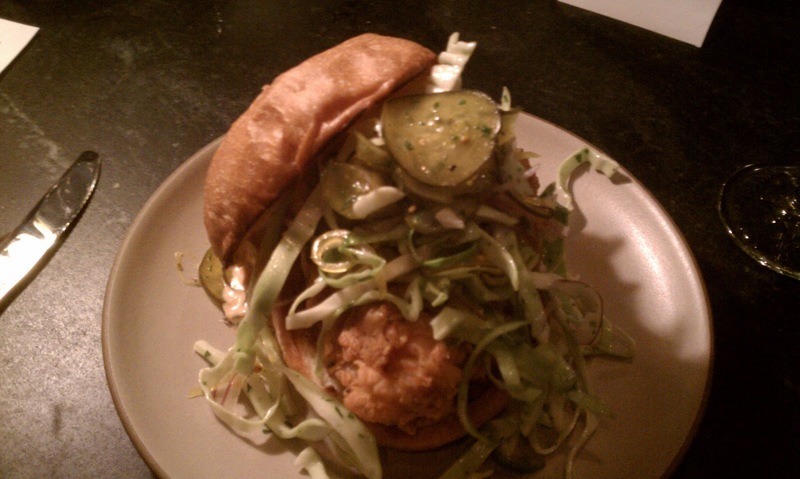 The bun is toasted and was able to withstand the crispy chicken, the pickles and the slaw. The chicken was just flavorful and wonderfully crispy. I thought I saw some patrons do a happy dance as they tasted this dish. A spicy option to begin (or end) your meal are the Sardines Escabeche, with crispy parsnip and habanero chiles. The sauce is redolent of citrus, the parsnips are extremely thin, light and crispy and then the kick of the habanero sets in and gives the strong flavor of the fish a suitably forward partner. My second favorite dish of the evening was the Pink Grouper. It was served with a "pho fumet, herbs, lime and bok choy." There was lots of cilantro, crispy onions in a pho broth with bok choy, purple lettuce, serrano chillies, mint and concentrated fish stock. 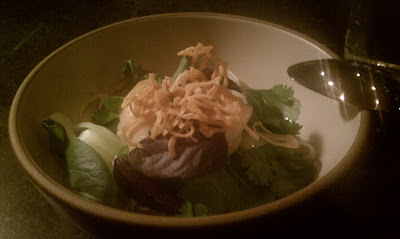 The grouper is a meaty fish and the dish captured the flavors in a traditional pho, while putting its own spin on it. This was not a soup, there was broth, but not too much; just enough to flavor the dish. 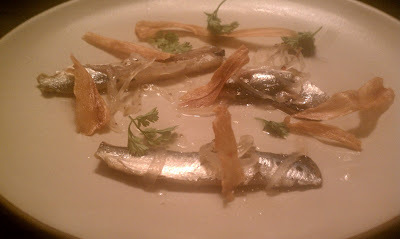 The crisp of the onions was a nice texture contrast to the rest of the dish. Alligator Schnitzel is served with a salad of hearts of palm, onion, mint, serrano chillies, and citrus sections, as well as an orange honey. 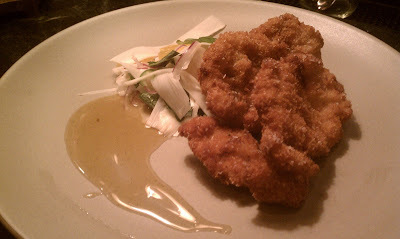 Alligator is rare to see on Los Angeles menus and alligator schnitzel is not something I have ever seen before anywhere. As both Shook and Dotolo are from Florida, this dish may be a nod in the direction of the land of their birth. The schnitzel was crispy and crunch and was on the salty side. The salad was a pleasant lighter contrast in between bites. I didn't use much of the honey as it didn't need it and I am not a fan of sweet. Bar manager Lindsay Nader was behind the stick and her list includes many traditional classics such as the Aviation, Negroni and Mint Mulep as well as modern classics such as the Little Italy. Nader is also not afraid to use cocktail umbrellas, serving them with several of her tropical drinks. 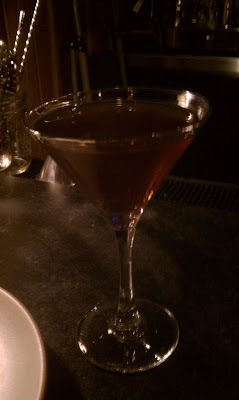 The Little Italy (below) is made with Rittenhouse Rye, Cynar, and Sweet Vermouth. 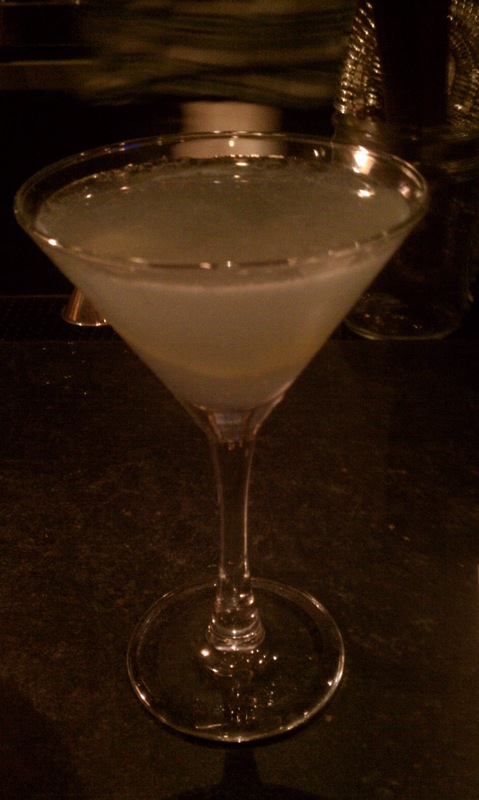 Nader credited it to Saunders of the Pegu Club in New York City. (Recipe here). 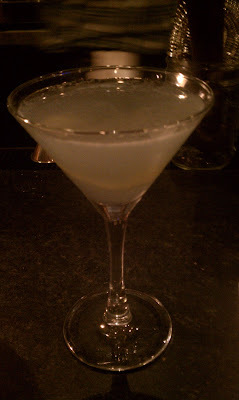 I have had this cocktail several times before and this was a very well made rendition. Nader's drink list is if anything too long for a 50 person restaurant, but the drinks are all legit, no appletinis are on offer. It wouldn't be an opening night without Kevin of Kevin Eats in the house, along with several other industry people including Jeff from Thrillest, Chef Michael Voltaggio of Ink and Pastry Chef Waylynn Lucas of the SLS. The overall vibe is mellow but with subtle ambition. The well managed front of the house is currently under the capable direction of Animal vet Helen Johannesen, who also developed the wine list which focuses on champagnes. Tonight the music included Bruce Springsteen's Thunder Road and an Iron Horse country style cover of Modest Mouse's Float On. 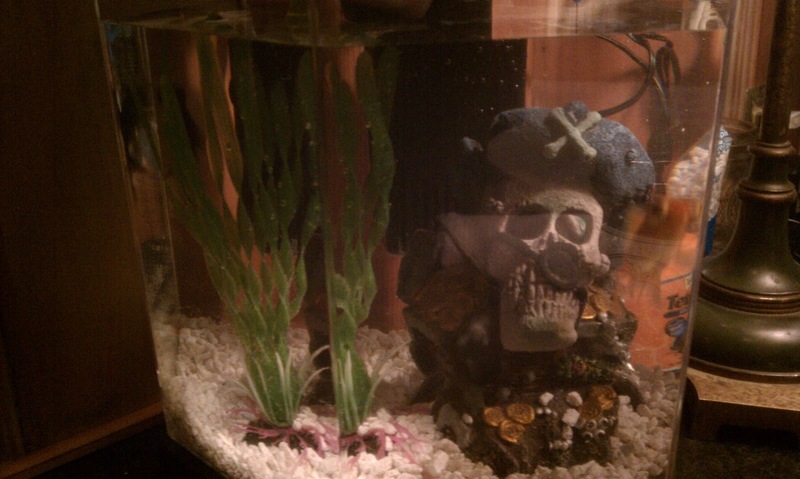 The aquarium on the bar (top photo) shows the sense of humor of the Son of A Gun team. They don't take themselves too seriously but they are also very particular about their vision. 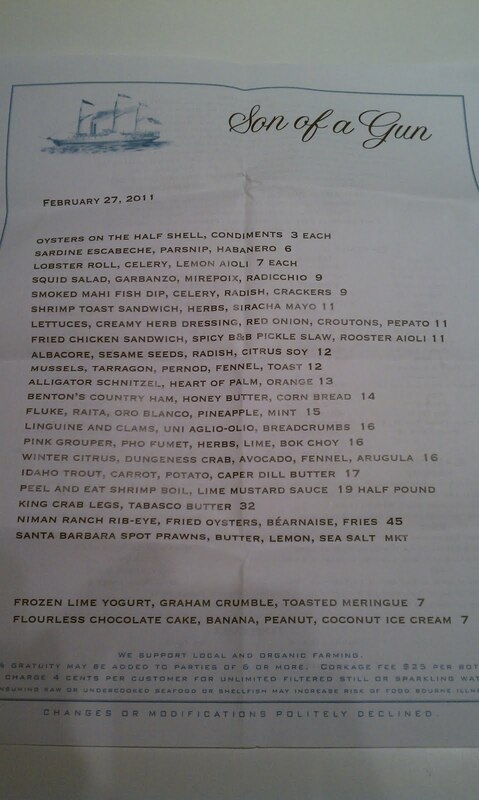 The menu hints at several nods to Florida/The South. Looking forward to trying Son of a Gun, whenever that may be. Sign me up for the alligator schnitzel, country ham with cornbread and Santa Barbara spot prawns.